Awesome interior blends a mix of 1920s and 1970s. After I decided to not pursue the house on Magnolia, I regrouped to see another batch of houses. These houses were less Victorian and more 1920s. One of the homes was a bungalow that had been on the market for over 2 years. The home was full of antiques, original wallpaper, and even remnants of the knob and tube wiring. The entry hall and living room almost sold me on the house but there was the issue of the basement getting water. Having a basement in a flood area is already a bad thing, plus the utilities were down in the basement which would also be a problem for flood insurance. Then add to the fact that the house received water and it seemed like I'd be looking at filling the basement and moving the mechanicals which didn't seem easy. Also, the interior needed a lot of work in addition to there being an entire detached cottage. The sad things is that the owners said they started getting water after all of the building in the area. Hard to say if that or sea level rise was the cause, but overdevelopment is a big concern with flooding as you pave over green space. Unique wallpaper in the dining room, but too far gone to be salvaged. Jerkinhead or clipped gable house. Notice the distinctive fishscale siding pattern - a common feature on old Wildwood houses. Slightly quirky bedroom layout with 2 closets side-by-side. The next house I saw was a bungalow/cottage with a jerkinhead roof. I'd seen this model of house previously in the Crest and liked it and there's tons of them in various configurations through the island. The Crest version had no parking and was listed 70K more. The Wildwood version was on a double lot which makes it a target of developers who love to buy up over-sized lots to pack with condos. The house was pretty much all original inside with original doors, built-ins and a quirky layout. Nothing over the top, but a good example of a solid middle-class beach home. The siding probably wasn't 1920s, but was a later addition that I see throughout Wildwood. I think it's an asbestos siding that has a fishscale or diamond pattern. 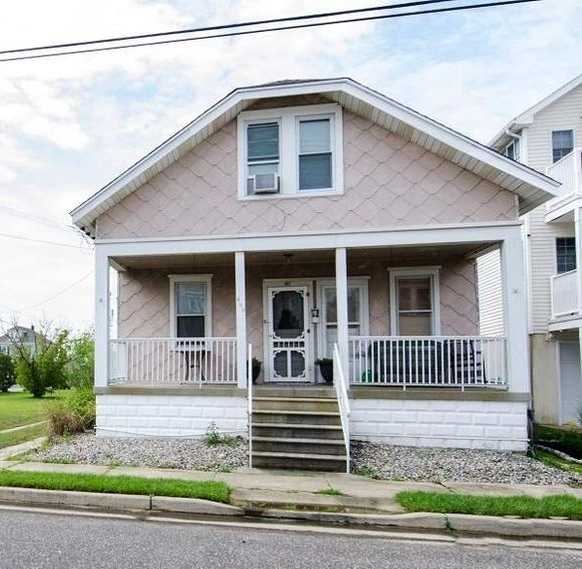 Even though the siding was probably added after the house was built, I would vote to keep the siding since it is a fixture in Wildwood. The house is a duplex but wasn't chopped up too terribly that I could see it reverting back to a single family. I felt pretty good about the house after viewing it. It needed work but nothing seemed terribly in disrepair so I decided to put in a solid offer for the place.